Arthur K. Wheelock Jr., “Rembrandt van Rijn, Anonymous Artist/The Apostle Paul/c. 1657,” Dutch Paintings of the Seventeenth Century, NGA Online Editions, https://purl.org/nga/collection/artobject/1198 (accessed April 21, 2019). After learning the fundamentals of drawing and painting in his native Leiden, Rembrandt van Rijn went to Amsterdam in 1624 to study for six months with Pieter Lastman (1583–1633), a famous history painter. Upon completion of his training Rembrandt returned to Leiden. Around 1632 he moved to Amsterdam, quickly establishing himself as the town’s leading artist, specializing in history paintings and portraiture. He received many commissions and attracted a number of students who came to learn his method of painting. 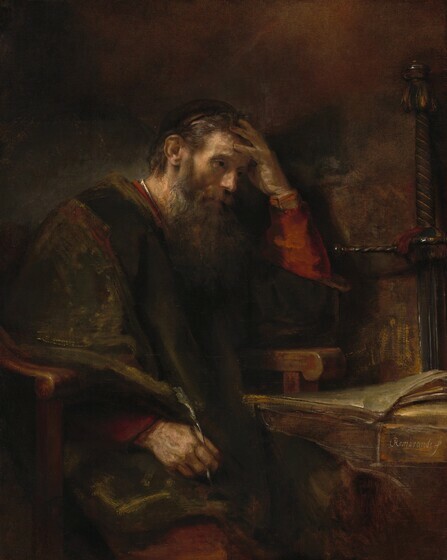 Throughout his life Rembrandt was fascinated by the apostle Paul, perhaps because Paul’s writings were the most important source for Reformation theology, or perhaps because he personified the Christian ideal of grace received independently of merit. Sitting at a table in his prison cell, the apostle ponders the words he is about to write in the epistle that lies before him. The solemn expression of Paul’s strong features underscores the depth of his belief and sense of purpose in his mission to spread Christianity to the heathens. The sword visible above the book is as much the "sword of the Spirit," the term he used to describe the word of God in his letter to the Ephesians, as it is the symbol of his military prowess before his conversion and the sign of his eventual beheading and martyrdom. The gentle light that illuminates Paul’s head, hand, and epistle has no defined point of origin. By depicting Paul at half length rather than full length, Rembrandt has brought the viewer closer to the figure of the saint, whose intensity of expression is keenly felt. 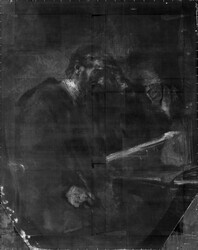 Sitting before a table in the recesses of his prison cell, Saint Paul has brought his hand to his head as he ponders the words he is about to write in the large tome that lies before him. The weighty expression of his strong features underscores the depth of his belief and the purposefulness of his mission to spread Christianity to the heathen. The sword visible above the book is as much the “sword of the Spirit,” the term he used to describe the word of God in his letter to the Ephesians (6:17), as it is the symbol of his military might before his conversion or the foreboding of his eventual martyrdom. See inventory no. 243, from National Gallery, London. The 1627 representation of Saint Paul in Stuttgart (see [fig. 1] [fig. 1] Rembrandt van Rijn, Saint Paul in Prison, 1627, oil on panel, Staatsgalerie, Stuttgart) offers a fascinating point of comparison with the Washington painting, for it demonstrates differences in attitude characteristic of Rembrandt’s stylistic and iconographic evolution. Whereas the Rembrandt of 1627 placed Paul in an identifiable environment, where bricks and mortar, wood and straw have been carefully delineated, and where the light source can be specifically identified, the Rembrandt of the late 1650s suppressed such references to time and place. In this later representation he created the sense of the prison cell rather than its specific character. The gentle light that illuminates Paul’s head, hand, and epistle, for example, has no defined point of origin. The late Rembrandt has also brought the viewer closer to the figure of the saint. He depicted Paul at half length rather than full length to allow the viewer to experience more fully the intensity of the saint’s expression. Paul’s expression is also markedly different in the two works. Whereas in the Stuttgart painting Paul brings his hand to his mouth and stares into the distance, seemingly uncertain of the meanings of the words inscribed in the tomes surrounding him, in the Washington painting Paul’s hand has come to his forehead as though he is pondering the significance of Christ’s life. As he stares toward his sword, his demeanor is pensive rather than bewildered. 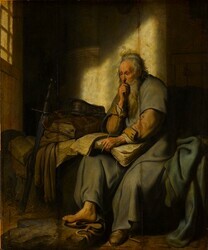 The differences are in part due to the broadness of Rembrandt’s mature painting technique, which emphasizes the structure of form without focusing on the specifics of veins, wrinkles, and hair, and in part due to the way light strikes Paul’s head, which leaves his eyes obscured in shadow. See inventory no. 751, from Hermitage, Saint Petersburg. Rembrandt adapted the model’s features in 1653 for another contemplative, historicizing painting, Aristotle Contemplating a Bust of Homer, in the Metropolitan Museum of Art, New York, and for The Philosopher, c. 1653, by a member of the Rembrandt Workshop (see The Philosopher). In The Apostle Paul, Rembrandt slightly generalized upon the model’s facial characteristics, both to suggest the historical nature of the subject and to enhance the contemplative mood of the scene. Rembrandt would also have adapted his painting techniques for modeling the face so that they would relate better to the broad handling evident in rest of the composition. For the technique of A Bearded Man in a Cap, see David Bomford, Jo Kirby, Ashok Roy, Axel Rüger, and Raymond White, Rembrandt, Art in the Making (London, 2006). In each instance Rembrandt drew his brush across the canvas with economical strokes that suggest but do not define form. He applied flesh tones without careful blending over a warm, underlying layer, and indicated features such as the eyes and nose with planes of color instead of accentuating them with sharp contour lines. He suggested the beard and hair with long, flowing strokes, in which a few lightly colored strands stand out against the darker forms of the rest. No commission for such a work is known. If so, the commission must have not have been fulfilled, and the painting was subsequently reduced in size and reconceived as a rectangular composition, with corners added at the top left and bottom edges. The current inserts most likely are not the original ones, however. See inventory no. Ben. 948, from Metropolitan Museum of Art, New York. By lowering the surface of the desk, Rembrandt effectively changed the meaning of the gesture of Paul’s left hand. Rather than providing physical support for the apostle’s head, it emphasizes the spiritual intensity of Saint Paul’s thoughts as he ponders the mysteries about which he writes. The X-radiographs also give the impression that in the original concept the apostle was staring at the text before him. In any event, the transformations in the composition, which emphasize the psychological over the physical, give a particularly fascinating insight into Rembrandt’s creative process during this period of his career. The signature was painted over a later paint layer that had covered damaged areas. An intervening varnish layer was also found between the paint layers. I would like to thank Susanna Griswald and Melanie Gifford for discussing these issues with me. Otto Benesch, “Worldly and Religious Portraits in Rembrandt’s Late Art,” Art Quarterly 19 (1956): 338–339, first noted the complementary relationship of the two paintings. Johan van Schuylenburg, The Hague; (his sale, The Hague, 20 September 1735, no. 31); Backer. Pierre-Louis Éveillard de Livois [1736-1790], Angers; (his estate sale, by Sentout, Angers, unknown date in 1791, no. 65); Gamba; (his sale, by Paillet and Geoffroy, Paris, 17-18 December 1811, 1st day, no. 26, bought in); purchased soon after this sale by Ferdinando Marescalchi [1754-1816], Bologna. Sir George Hayter [1792-1871], London, by 1841; (his sale, Christie & Manson, London, 3 May 1845, no. 82, as Portrait of Cornelius Von Schrevellier [Schrevellius Translater(sic) of Homer); (Nieuwenhuys). James-Alexandre, comte de Pourtalès-Gorgier [1776-1855], Paris; (his sale, at his residence, Paris, 27 March-4 April 1865 [this lot 31 March], no. 182); purchased by (Otto Mündler, Paris) for Ivor Bertie Guest, 1st baron Wimborne [1835-1914], Canford Manor, Dorsetshire. (Arthur J. Sulley & Co., London); Peter A.B. Widener, Lynnewood Hall, Elkins Park, Pennsylvania, by 1912; inheritance from Estate of Peter A.B. Widener by gift through power of appointment of Joseph E. Widener, Elkins Park, Pennsylvania; gift 1942 to NGA. Burton Fredericksen brought to the Gallery’s attention details of the provenance from Livois through Marescalchi; see his 14 February 1991 letter to Suzannah Fabing, in NGA curatorial files. Further details have been found in the The Getty Provenance Index© Databases. This was possibly Bartolomeo Gamba (1776-1841), bibliographer, publisher, and librarian of the Biblioteca Nazionale Marciana in Venice. An 1813 inventory of Marescalchi's collection includes the painting: “Una mezza figura in grande rappresentante una Persona in meditazione o studiosa, di grande maniera, comprata alla vendita di Monsieur Gamba negozio di Parigi, come dal suo Catalogo. Quadro grande in piedi” (Monica Proni, “Per la ricostruzione della quadreria del Conte Ferdinando Marescalchi (1753-1816),” Antologia di Belle Arti, nos. 33/34 : 39). It is also included in later inventories of the Marescalchi collection made in 1817 and 1824 (Monica Preti Hamard, Ferdinando Marescalchi (1754-1816): Un collezionista italiano nella Parigi napoleonica, 2 vols., Bologna, 2005: 1:384, fig. 48; 2:131-132). Hayter lent the painting an exhibition in 1841. The dealer’s name is written below lot 82 in a copy of the sale catalogue annotated by Lord Northwick, now at Yale University (copy in NGA curatorial files). A Catalogue of the Pictures at Canford Manor in the Possession of Lord Wimborne, Edinburgh, 1888: 63-64, no. 154. British Institution for Promoting the Fine Arts in the United Kingdom, London, 1841, no. 71, as Portrait of Cornelius Pietersz Hooft. Rembrandt in the National Gallery of Art [Commemorating the Tercentenary of the Artist's Death], National Gallery of Art, Washington, D.C., 1969, no. 17, 27, repro. 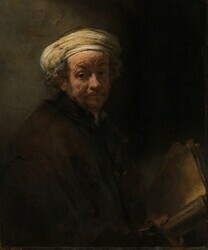 Rembrandt's Late Religious Portraits, National Gallery of Art, Washington, D.C.; The J. Paul Getty Museum, Los Angeles, 2005, no. 2, repro. 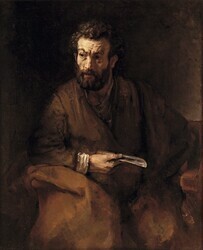 Rembrandt's Saint Bartholomew, Timken Museum of Art, San Diego, 2005-2006, no cat. Rembrandt: Pintor de Historias [Rembrandt: Painter of History], Museo Nacional del Prado, Madrid, 2008-2009, no. 36, repro. The original support is a medium-weight, plain-weave fabric. Triangular fabric inserts have been added to the upper left, lower left and lower right corners. The two inserts in the lower corners appear to be cut from one fabric, which is coarser than the original fabric, and the one in the upper corner is from a third fabric, which is slightly finer than the original. The bottom corner inserts appear much lighter in the X-radiograph, indicating they were prepared with a ground consisting of denser pigments than the original and they may have been cut from a previously painted composition. The support and inserts have been lined and the tacking margins have been removed. No cusping is visible. The original canvas was prepared with a brownish quartz-based ground, of the type that is thought to be specific to Rembrandt and his workshop. A faint white area in a roughly oval form is visible in the X-radiographs. In the lower part of the painting, where the oval shape is most clearly visible, it is significantly narrower than the present confines of the composition, though it extended beyond the top and bottom edges of the current canvas. A number of artist’s changes were observed in the X-radiographs and during microscopic examination. The painting seems to have been executed in two stages. In some areas of the painting cross-sections show an intervening layer typical of varnish or "oiling out" between the first and second stages. Initially the apostle’s elbow rested on a book lying on an inclined lectern and the background to the right was laid out with buff-colored paint. Significant revisions carried out in the second stage replaced the lectern with a flat surface and introduced the arm of the chair on which the saint leans his elbow. The sword at the right also may have been introduced at this stage. Paint was applied thinly in dark passages and thickly in light passages, with brushes and a palette knife. Flesh tones are heavily impasted and were blended wet-into-wet. Severe abrasion in thinly painted passages has exposed the ground layer, and thicker passages are moderately abraded. Discolored varnish and inpainting were removed during a conservation treatment that was completed in 2002. Early restorations had altered the original background, introducing forms that vaguely suggested architectural features. Removal of old repaint returned the background to the original simple wall. Paint on the front of the lectern, including the signature, is not original; microscopic examination confirms that it was applied over age cracks. This repaint was not removed, but was retained for historical documentation. The ground was analyzed by Karin Groen using cross-sections and energy dispersive X-ray analysis (see Karin Groen, "Grounds in Rembrandt's Workshop and in Paintings by His Contemporaries," in Stichting Foundation Rembrandt Research Project,　A Corpus of Rembrandt Paintings, vol. 4, Self-Portraits, ed. Ernst van de Wetering [Dordrecht, 2005], 666–667). Groen studied the grounds on 153 paintings by Rembrandt and his workshop. She also studied sixty paintings created in Amsterdam in the seventeenth century by artists who were not associated with Rembrandt and his workshop and numerous other Dutch paintings that originated outside Amsterdam in the seventeenth century. She found quartz only in the paintings from Rembrandt and his workshop. In the 1995 catalogue of the National Gallery of Art’s Dutch paintings collection, the white oval shape was mistakenly identified as a "moderately thick, off-white ground." 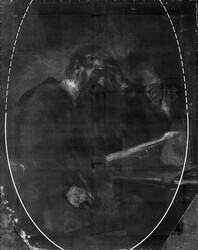 Cross-sections of the recto analyzed by the NGA Scientific Research department during the conservation treatment on the painting in 1999–2002, however, did not reveal differences in the ground layers within and without the oval shape visible in the X-radiographs. It is possible that the X-ray dense material is on the reverse, hidden beneath the lining fabric (cross-sections on file with the NGA Scientific Research department). Cross-sections were analyzed by the NGA Scientific Research department (see report dated October 3, 2002, which summarizes the revisions to the painting, in NGA Conservation department files) and Karin Groen, "Grounds in Rembrandt's Workshop and in Paintings by His Contemporaries," in Stichting Foundation Rembrandt Research Project,　A Corpus of Rembrandt Paintings, vol. 4, Self-Portraits, ed. Ernst van de Wetering (Dordrecht, 2005) 318–334, including the Analytical Table on page 324. The paint was analyzed by the NGA Scientific Research department using cross-sections (see report dated October 2002 in NGA Conservation department files). Smith, John. A Catalogue Raisonné of the Works of the Most Eminent Dutch, Flemish and French Painters. 9 vols. London, 1829-1842: 9(1842):800, no. 30. Vosmaer, Carel. Rembrandt Harmens van Rijn, sa vie et ses œuvres. The Hague, 1868: 308. Blanc, Charles. 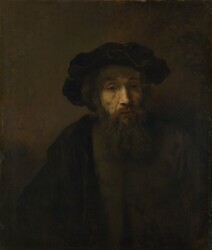 L'Oeuvre de Rembrandt. 2 vols. Paris, 1873: 2:291. Vosmaer, Carel. Rembrandt Harmens van Rijn: sa vie et ses oeuvres. 2nd ed. The Hague, 1877: 359, 561. Dutuit, Eugène. Tableaux et dessins de Rembrandt: catalogue historique et descriptif; supplément à l'Oeuvre complet de Rembrandt. Paris, 1885: 7, 19, 49, 60, 69. A Catalogue of the Pictures at Canford Manor in the Possession of Lord Wimborne. Edinburgh, 1888: 63-64, no. 154. Michel, Émile. Rembrandt: Sa vie, son oeuvre et son temps. Paris, 1893::450, 555. Michel, Émile. Rembrandt: His Life, His Work, and His Time. 2 vols. Translated by Florence Simmonds. New York, 1894: 2:132, 237. Bode, Wilhelm von, and Cornelis Hofstede de Groot. The Complete Work of Rembrandt. 8 vols. Translated by Florence Simmonds. Paris, 1897-1906: 5:29-30, 174, no. 382, repro. Bell, Malcolm. Rembrandt van Rijn and His Work. London, 1899: 82, 140. Rosenberg, Adolf. Rembrandt, des Meisters Gemälde. Klassiker der Kunst in Gesamtausgaben 2. 2nd ed. Stuttgart, 1906: repro. 308, 403, 420. Bell, Malcolm. Rembrandt van Rijn. The great masters in painting and sculpture. London, 1907: 79, 124. Hofstede de Groot, Cornelis. A Catalogue Raisonné of the Works of the Most Eminent Dutch Painters of the Seventeenth Century. 8 vols. Translated by Edward G. Hawke. London, 1907-1927: 6(1916):124, no. 178. Hofstede de Groot, Cornelis. Beschreibendes und kritisches Verzeichnis der Werke der hervorragendsten holländischen Maler des XVII. Jahrhunderts. 10 vols. Esslingen and Paris, 1907-1928: 6(1915):102, no. 178. Rosenberg, Adolf. The Work of Rembrandt, reproduced in over five hundred illustrations. Classics in Art 2. New York, 1907: 308, repro. Thieme, Ulrich, and Felix Becker, eds. Allgemeines Lexikon der bildenden Künstler von der Antike bis zur Gegenwart. 37 vols. Leipzig, 1907-1950: 29(1935):266. Rosenberg, Adolf. Rembrandt, des Meisters Gemälde. Klassiker der Kunst in Gesamtausgaben 2. 3rd ed. Stuttgart and Berlin, 1908: repro. 384, 561, 584. Rosenberg, Adolf. Rembrandt: Des Meisters Gemälde. Edited by Wilhelm R. Valentiner. Klassiker der Kunst in Gesamtausgaben 2. Stuttgart and Leipzig, 1909: repro. 384, 561. Hofstede de Groot, Cornelis, and Wilhelm R. Valentiner. Pictures in the collection of P. A. B. Widener at Lynnewood Hall, Elkins Park, Pennsylvania: Early German, Dutch & Flemish Schools. Philadelphia, 1913: unpaginated, no. 37, repro. Rosenberg, Adolf. The Work of Rembrandt, reproduced in over five hundred illustrations. Classics in Art 2. Edited by Wilhelm R. Valentiner. 2nd ed. New York, 1913: repro. 384. Valentiner, Wilhelm R. The Art of the Low Countries. Translated by Mrs. Schuyler Van Rensselaer. Garden City, NY, 1914: 248, no. 72. Rosenberg, Adolf. The Work of Rembrandt. Edited by Wilhelm R. Valentiner. Classics in Art 2. 3rd ed. New York, 1921: 384, repro. Valentiner, Wilhelm R. Rembrandt: wiedergefundene Gemälde (1910-1922). Klassiker der Kunst in Gesamtausgaben 27. Stuttgart and Berlin, 1921: 384, repro. Valentiner, Wilhelm R. The Henry Goldman Collection. New York, 1922: no. 14. Meldrum, David S. Rembrandt’s Painting, with an Essay on His Life and Work. New York, 1923: 202, pl. 400. Paintings in the Collection of Joseph Widener at Lynnewood Hall. Intro. by Wilhelm R. Valentiner. Elkins Park, Pennsylvania, 1923: unpaginated, repro., as by Rembrandt. Valentiner, Wilhelm R. "The Henry Goldman Collection." Art News 25 (May 1927): 16-17, repro. Valentiner, Wilhelm R. "Rediscovered Rembrandt Paintings." The Burlington Magazine 57, no. 333 (December 1930): 266. Paintings in the Collection of Joseph Widener at Lynnewood Hall. Intro. by Wilhelm R. Valentiner. Elkins Park, Pennsylvania, 1931: 62-63, repro. Valentiner, Wilhelm R. Rembrandt Paintings in America. New York, 1931: no. 127, repro. Bredius, Abraham. Rembrandt Gemälde, 630 Abbildungen. Vienna, 1935: no. 612, repro. Bredius, Abraham. Rembrandt Schilderijen, 630 Afbeeldingen.Utrecht, 1935: no. no. 612, repro. Bredius, Abraham. The Paintings of Rembrandt. New York, 1936: no. 612, repro. Bredius, Abraham. The Paintings of Rembrandt. 2 vols. Translated by John Byam Shaw. Oxford, 1942: 1:no. 612; 2:repro. National Gallery of Art. Works of art from the Widener collection. Washington, 1942: 6, no. 655. National Gallery of Art. Paintings and Sculpture from the Widener Collection. Washington, 1948 (reprinted 1959): 44, repro. Benesch, Otto. "Worldly and Religious Portraits in Rembrandt’s Late Art. "The Art Quarterly 19 (Winter 1956): 338-340, 343, fig. 3. Goldscheider, Ludwig. Rembrandt Paintings, Drawings and Etchings. London, 1960: 180, no. 101, repro. Walker, John. National Gallery of Art, Washington, D.C. New York, 1963: 313, repro. National Gallery of Art. Summary Catalogue of European Paintings and Sculpture. Washington, 1965: 110. Bauch, Kurt. Rembrandt Gemälde. Berlin, 1966: 12, no. 221 (repro. ), no. 223 (text); the reproductions and corresponding text for nos. 221 and 223 appear to have been switched. Gerson, Horst. Rembrandt Paintings. Amsterdam, 1968: 378, no. 295, repro. National Gallery of Art. European Paintings and Sculpture, Illustrations. Washington, 1968: 97, no. 655, repro. Bredius, Abraham. Rembrandt: The Complete Edition of the Paintings. Revised by Horst Gerson. 3rd ed. London, 1969: repro. 515, 613, no. 612. Haak, Bob. Rembrandt: His Life, His Work, His Time. Translated by Elizabeth Willems-Treeman. New York, 1969: 298-299, no. 497, repro. National Gallery of Art. Rembrandt in the National Gallery of Art: Commemorating the tercentenary of the artist's death. Exh. cat. National Gallery of Art, Washington, 1969: 27, no. 17, repro. Benesch, Otto. Otto Benesch Collected Writings. 2 vols. Edited by Eva Benesch. London and New York, 1970: 1:193, fig. 158. National Gallery of Art. European paintings: An Illustrated Summary Catalogue. Washington, 1975: 286-287, no. 655, repro. Walker, John. National Gallery of Art, Washington. New York, 1975: 283, no. 374, color repro. Trafalgar Galleries. In the light of Caravaggio. Exh. cat. Trafalgar Galleries, London, 1976: 21-22, repro. Trafalgar Galleries. Old Master Paintings. Exh. cat. Trafalgar Galleries, London, 1977: 62-63, repro. Watson, Ross. The National Gallery of Art, Washington. New York, 1979: 70-71, pl. 55. Halewood, William H. Six Subjects of Reformation Art: A Preface to Rembrandt. Toronto, 1982: 118, 120, fig. 73. Schwartz, Gary. Rembrandt: Zijn leven, zijn schilderijen. Maarssen, 1984: 310, no. 351, repro. Walker, John. National Gallery of Art, Washington. Rev. ed. New York, 1984: 283, no. 368, color repro., as by Rembrandt van Ryn. National Gallery of Art. European Paintings: An Illustrated Catalogue. Washington, 1985: 331, repro. Schwartz, Gary. Rembrandt: His Life, His Paintings. New York, 1985: 310, 322, no. 351, repro. Guillaud, Jacqueline, and Maurice Guillaud. Rembrandt: das Bild des Menschen. Translated by Renate Renner. Stuttgart, 1986: 528, no. 615, repro. Guillaud, Jacqueline, and Maurice Guillaud. Rembrandt, the human form and spirit. Translated by Suzanne Boorsch et al. New York, 1986: no. 615, repro. Sutton, Peter C. A Guide to Dutch Art in America. Washington and Grand Rapids, 1986: 313, fig. 468. Tümpel, Christian. Rembrandt. Translated by Jacques and Jean Duvernet, Léon Karlson, and Patrick Grilli. Paris, 1986: repro. 343, 421, no. A16. Proni, Monica. "Per la ricostruzione della quadreria del Conte Ferdinando Marescalchi (1753-1816)." Antologia di Belle Arti. Studi sul neoclassicismo 1, nos. 33-34 (1988): 33-41. Martz, Louis L. From Renaissance to Baroque: essays on literature and art. Columbia, Missouri, 1991: 34-35, fig. 13. The Revell Concise Bible Dictionary. Tarrytown, N.Y., 1991: 764, repro. Wheelock, Arthur K., Jr. Dutch Paintings of the Seventeenth Century. The Collections of the National Gallery of Art Systematic Catalogue. Washington, 1995: 241-247, color repro. 243. Timken Museum of Art. Timken Museum of Art: European works of art, American paintings, and Russian icons in the Putnam Foundation collection. San Diego, 1996: fig. 2. White, Christopher, and Quentin Buvelot. 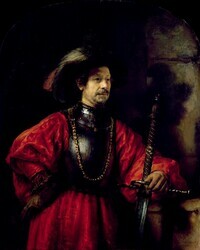 Rembrandt by Himself. Exh. cat. National Gallery, London; Royal Cabinet of Paintings Mauritshuis, The Hague. New Haven, 1999: 213, fig. 81b. Preti-Hamard, Monica. Ferdinando Marescalchi (1754-1816): un collezionista italiano nella Parigi napoleonica. 2 vols. Collana di Saggi, studi, richerche, i figli di Mercurio. Bologna, 2005: 1:fig. 48; 2:131-132. Wheelock, Arthur K., Jr., and Peter C. Sutton. Rembrandt's Late Religious Portraits. Exh. cat. National Gallery of Art, Washington; J. Paul Getty Museum, Los Angeles. Chicago, 2005: 74-77, repro. 75. Wheelock, Arthur K., Jr., Anne T. Woollett, and Peter C. Sutton. Rembrandt's Apostles. Exh. cat. Timken Museum of Art, San Diego, 2005: repro. 12, 13-19. Wheelock, Arthur K., Jr., Peter C. Sutton, and Anne T. Woollett. "Saints as Men: Rembrandt's New Testament Portraits." Bible Review Magazine Spring (2005): repro. 26, 28. Vergara, Alexander. Rembrandt, pintor de historias. Exh. cat. Museo Nacional del Prado, Madrid, 2008: no. 36, 202, repro. 203. Keyes, George S., Tom Rassieur, and Dennis P. Weller. Rembrandt in America: collecting and connoisseurship. Exh. cat. North Carolina Museum of Art, Raleigh; Cleveland Museum of Art; Minneapolis Institute of Arts. New York, 2011: 152-154, fig. 84. Gifford, E. Melanie, Susanna P. Griswold, and John K. Delaney. "The Apostle Paul by Rembrandt (and Workshop?) at the National Gallery of Art, Washington: evolution and alteration." Techne 35 (2012): 30-35, fig. 1, figs. 2-9 (conservation images and details). For the most reasoned assessment of the attribution of the Mauritshuis painting, with which I agree, see Ary Bob de Vries, Magdi Tóth-Ubbens, and W. Froentjes, Rembrandt in the Mauritshuis: An Interdisciplinary Study (Alphen aan den Rijn, 1978), 148–165. The authors argue that the painting was executed at two distinct periods, about 1655 and about 1660–1665. See inventory no. 751, from Hermitage, Saint Petersburg. For the technique of A Bearded Man in a Cap, see David Bomford, Jo Kirby, Ashok Roy, Axel Rüger, and Raymond White, Rembrandt, Art in the Making (London, 2006). The layer or layers used to prepare the support to hold the paint. layer applied on the recto of the canvas support. The new diagram is made with the understanding that the oval relates to the shape of a ground or paint layer applied to the verso of the canvas. This layer would have covered the exposed area of the support and, hence, could have ended at the curved inner edge of the stretcher. The oval shape in this diagram, consequently, is broader in shape, as it also incorporates the width of the stretcher. No other large-scale paintings depicting apostles or evangelists are known to have been painted in an oval format. Rembrandt’s The Risen Christ, 1661 (Alte Pinakothek, Munich, inv. no. 6471; Br. 630), was cut into an oval form at some point in its history, but was probably conceived as a rectangular painting. The central portion of Rembrandt’s Christ in the Hyde Collection, Glens Falls, New York (Br. 628), was also cut into an irregular oval before being reattached to the original canvas. No commission for such a work is known. See inventory no. Ben. 948, from Metropolitan Museum of Art, New York.